Discover a world of fascinating award winning miniature collectibles in a myriad of popular themes. Each collection is professionally sculpted and finely hand painted. Great for school projects or it's just fun to display near your computer. 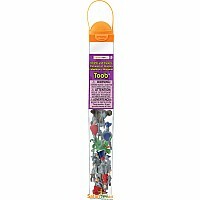 Excellent "carry-along" for any excursion since the figures are neatly packed in a reusable acetate tube. Choose from over 45 different themes! All our products are phthalate-free and thoroughly safety tested to safeguard your child's health. Safari LTD takes pride in providing breathtaking, innovative and value priced figures for now over 3 generations. Featured is our Knights Dragon Toob. Replica Size: 1.5" to 3" H (4 to 7.5 cm). 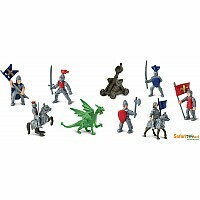 Suggested age 3+ Toob includes: Pikeman, Knight with Lance, Knight with Bttle AX, Knight with Halbred, Knight with Great Sword, Knight with Two-Handed Sword, Red War Horse, Blue War Horse, Knight with Pennon, Catapult, Mounted Knight and Dragon.